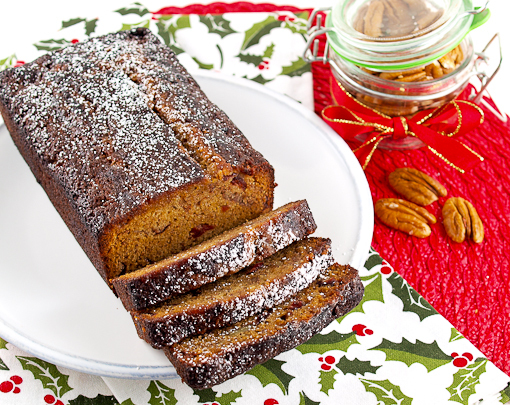 I’m not going to lie … this is a highfalutin fruit cake. Every year I make a fruit cake. I find I really like them around the holidays. There is something comforting about a booze soaked slice of cake which has been festooned with fruits and nuts. (Yes, I said festooned. It is a great word and we do not use it often enough I think.) I know they are not popular and are usually derided as inedible, but that is the kind of cake loaded with bizarrely exotic neon colored fruits. 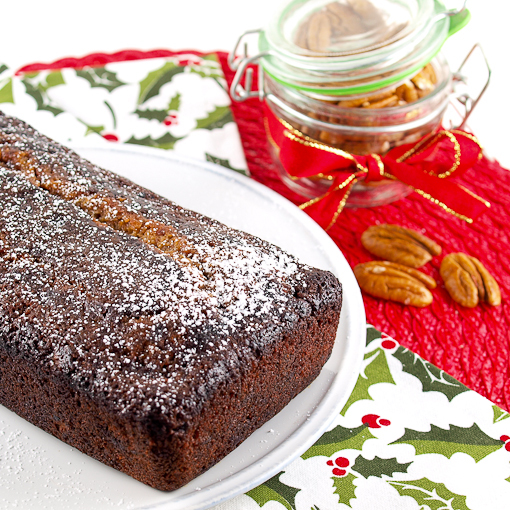 This cake is simply made with dry cranberries, chopped pecans, and lots and lots of bourbon. You do not have to try it, but if you don’t you are the one missing out. This cake improves over time, but I find it tastes best after about two weeks. 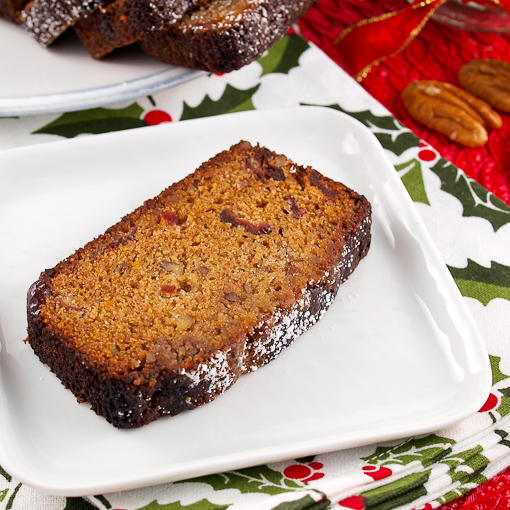 Like most fruit cakes this one is soaked with alcohol. In this case it is bourbon. I like the woody notes paired with the buttery pecans and sharp cranberries. I usually make this cake and soak it once it is cooled, then soak it two or three times a week with more bourbon until I am ready to serve it. If you are not a fan of bourbon you could use rum here and it would be lovely. This cake is lovely at room temperature, but you should try it toasted with some butter. It is heaven!! Heat the oven to 350F and spray two 8-inch loaf pans with non-stick cooking spray. 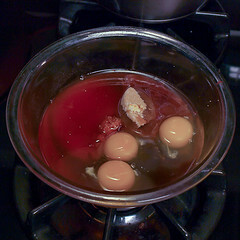 Heat the bourbon in a small sauce pan until it comes to a boil. 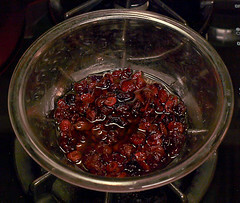 In a small bowl combine the hot bourbon with the cranberries. Allow to stand until the mixture comes to room temperature. Drain the cranberries, reserving the bourbon. 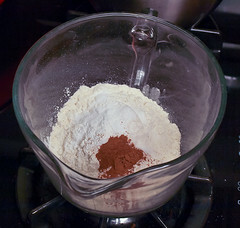 In a large bowl combine the flour, baking powder, baking soda, cinnamon, and salt. Whisk to combine. 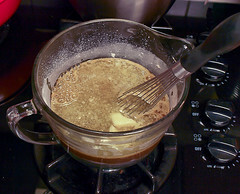 In a separate bowl combine the reserved bourbon, orange zest, vanilla, eggs, sugar, brown sugar, and golden syrup. Whisk until smooth. 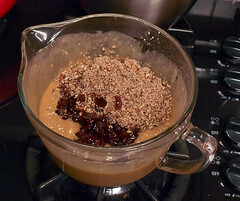 Pour the wet ingredients over the dry and stir until the mixture is mostly smooth. Add the cranberries and pecans and fold to incorporate. 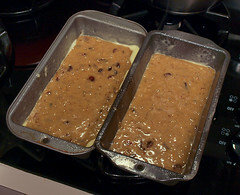 Divide the batter between the prepared pans and bake for 30 minutes, then cover the pans with foil, reduce the heat to 325F and bake for an additional 10 to 15 minutes, or until the cake springs back when gently pressed in the center and the sides of the cake are starting to come away from the sides of the pan. The outer crust will be quite dark. Allow the cake to cool in the pan for 30 minutes, then turnout onto a wire rack to cool completely. Once cool brush 1 tablespoon of bourbon over the top of each cake. Wrap the cakes well with plastic wrap, then a layer of aluminum foil and allow to stand at room temperature for two days. 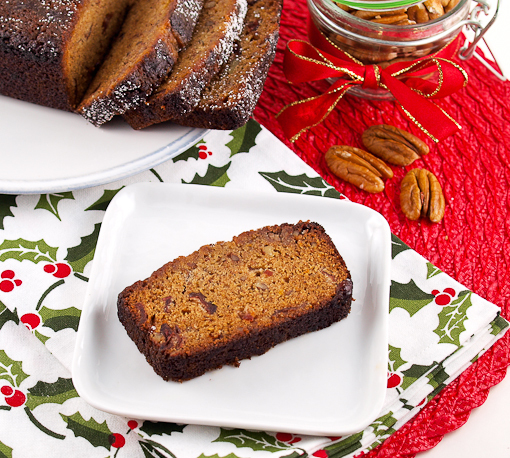 Soak the cakes with 1 tablespoon of bourbon each at least every three days for two weeks. Serve at room temperature or slightly warm. Enjoy!